• Special power outlets (EU/UK/US) Most of the Cosy Studios face the Winter Garden for a unique atmosphere of peace and quiet. 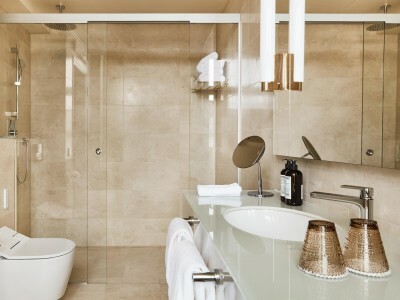 The luxurious Spanish marble bathroom includes a soothing rain shower. As for the digital experience, it is individually adjustable. Poulsen lighting fixtures create a cozy warmth with classic furniture from Vitra and e15. 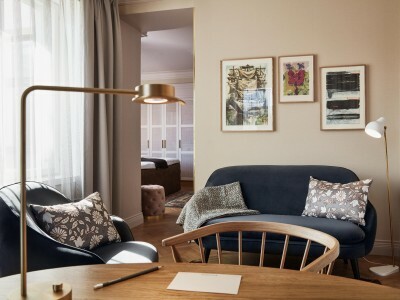 Walls are adorned with lithographs from Finnish abstract art pioneers such as Juhana Blomstedt, Ernst Mether Borgström and Lars-Gunnar Nordström. Well-being is a vital element of St. George. 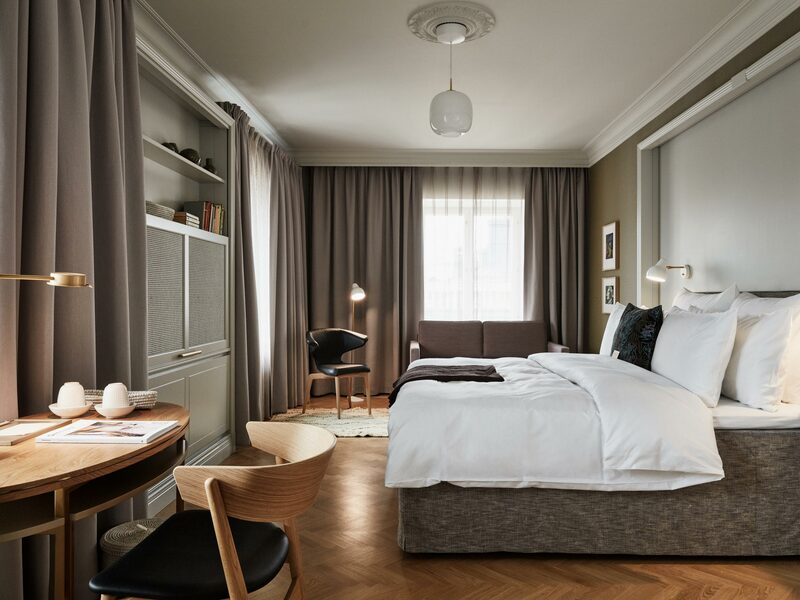 The Hintsa Performance Experience enhances your well-being by offering a biomechanics guide for in-room exercises while a customized minibar offers healthy refreshments. • Special power outlets (EU/UK/US) Serenity Studios face either Lönnrotinkatu street or the Winter Garden. As for the digital experience, it is individually adjustable. 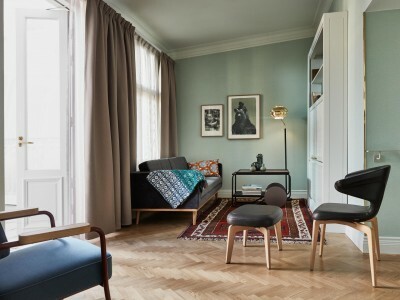 Serenity Studios feature classic designer furniture from the Danish companies &tradition and Sibast, Poulsen lighting fixtures and a comfortable writing desk. 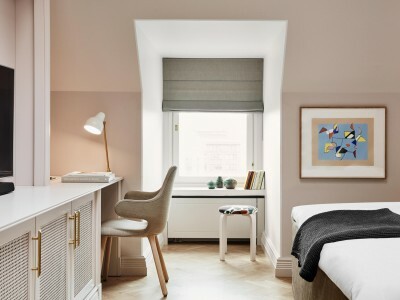 Selected rooms also include a sofa bed, making them spacious family rooms. The walls of the Serenity Studios are adorned with lithographs from Finnish abstract art pioneers. Well-being is a vital element of St. George. The Hintsa Performance Experience enhances your well-being by offering a biomechanics guide for in-room exercises while a customized minibar offers healthy refreshments. 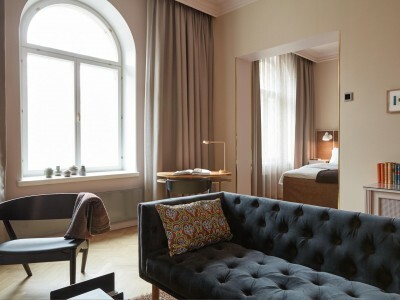 • Special power outlets (EU/UK/US) Companion Twin rooms face either Lönnrotinkatu street or the Winter Garden. Dux Delight mattresses, expertly crafted with precision, provide the perfect sleep. 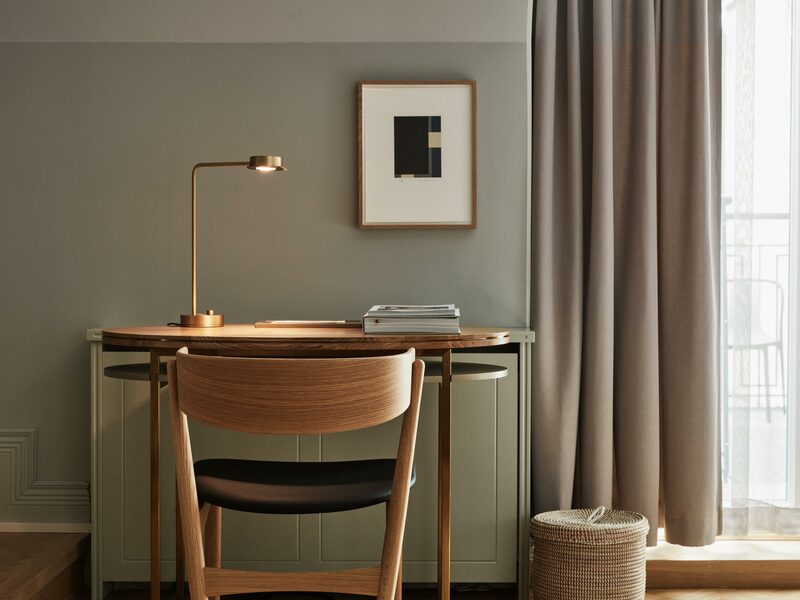 Like the Cosy Studios, soft mint green with a touch of pearl grey creates a calm ambiance. The luxurious Spanish marble bathroom includes a soothing rain shower. 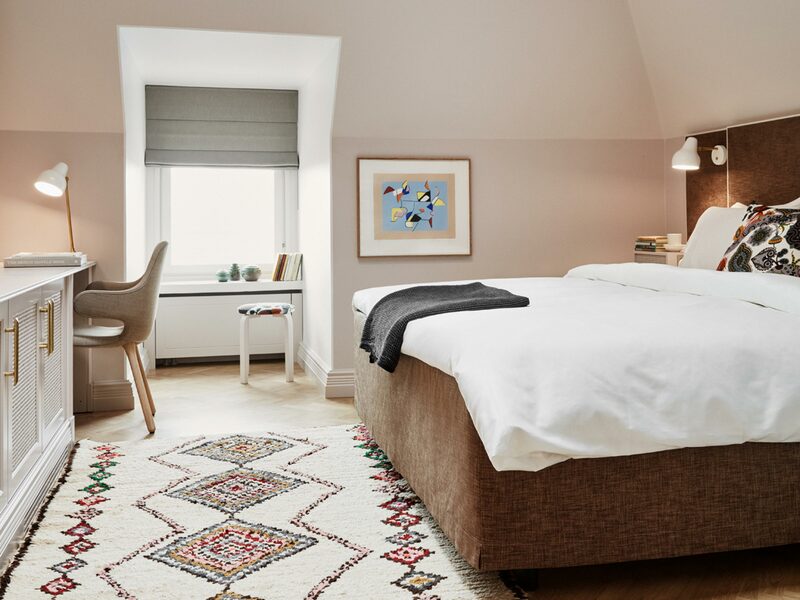 The room also features furniture design classics from the Danish companies &tradition and Sibast and artwork by Finnish pioneers of abstract modern art, while Poulsen lighting fixtures provide the finishing touch. Well-being is a vital element of St. George. The Hintsa Performance Experience enhances your well-being by offering a biomechanics guide for in-room exercises. • Special power outlets (EU/UK/US) Sky Attic Studios allow you to peacefully marvel at the stars and the four seasons of Finland. DUX Delight mattresses, expertly crafted with precision, provide the perfect sleep. 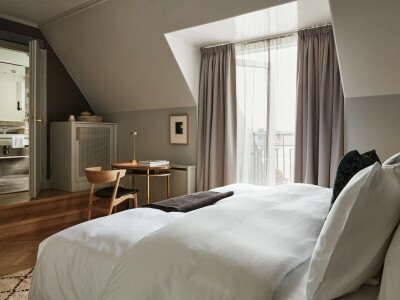 The design of the rooms is similar to the Serenity Studios, but in a cosy attic. Windows in the luxurious marble bathroom bestow lots of natural light. Rooms include Poulsen lighting fixtures and integrated work desks. The walls of the Sky Attics are adorned with lithographs from Finnish abstract art pioneers. Well-being is a vital element of St. George. 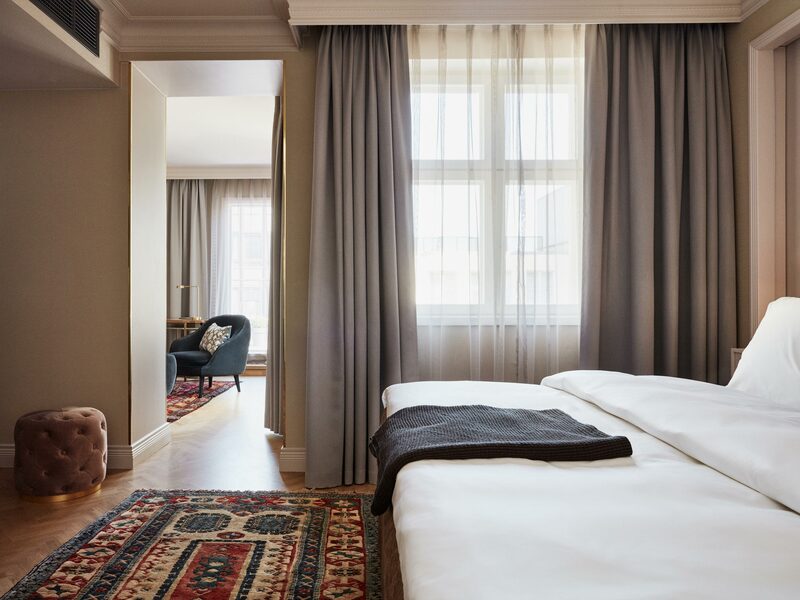 The Hintsa Performance Experience enhances your well-being by offering a biomechanics guide for in-room exercises while a customized minibar offers healthy refreshments. • Special power outlets (EU/UK/US) The carefully selected color palette of blue, yellow and orange found in the textiles, art and curated objects provides a warm, inviting ambiance. 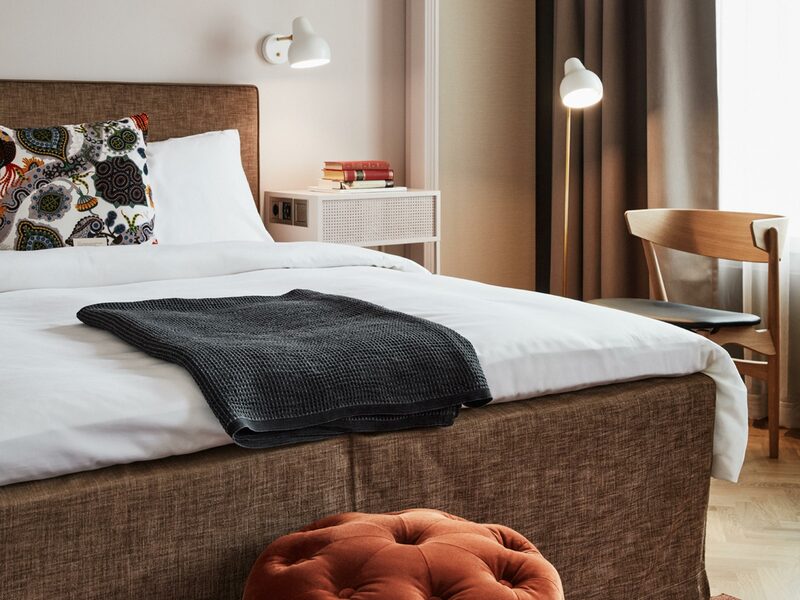 In select Ateliers, beds are equipped with state-of-the-art sleep monitors, giving guests the option to evaluate their quality of sleep. Armchairs have been carefully selected from the German design company Classicon and Chair Münich, a renowned vintage classic from Berlin-based architect duo Sauerbruch and Hutton. The superior look and feel of the bathroom's separate rain shower, double washbasin and bathtub is completed by Santo Tomas marble tiles from Mexico. The Hintsa Performance Experience offers a biomechanics guide for in-room exercises. • Special power outlets (EU/UK/US) The carefully selected color palette of blue, yellow and orange in the textiles, art and curated objects provides a warm, inviting ambiance. In select Ateliers, beds are equipped with state-of-the-art sleep monitors, giving guests the option to evaluate their quality of sleep. 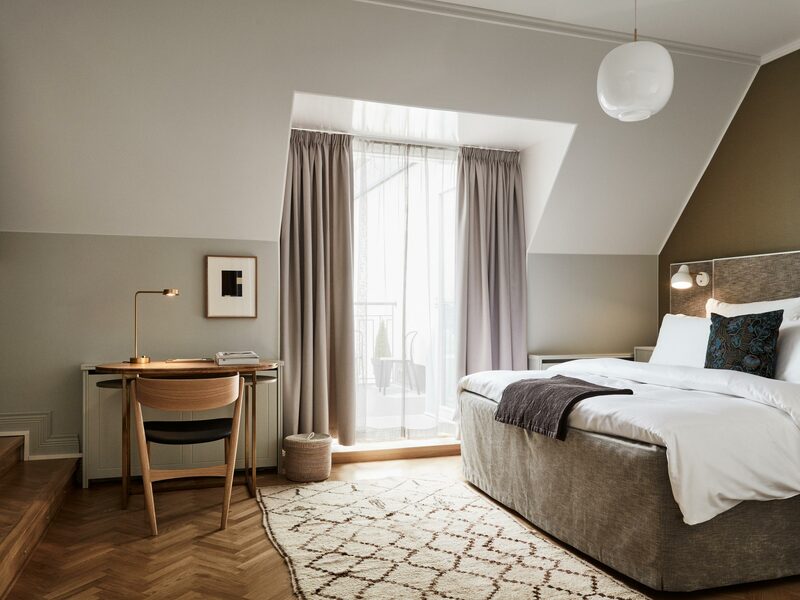 Armchairs have been carefully selected from the German design company Classicon and Chair Münich, a renowned vintage classic from Berlin-based architect duo Sauerbruch and Hutton. The superior look and feel of the bathroom's separate rain shower, double washbasin and bathtub is completed by Santo Tomas marble tiles from Mexico. The Hintsa Performance Experience offers a biomechanics guide for in-room exercises. 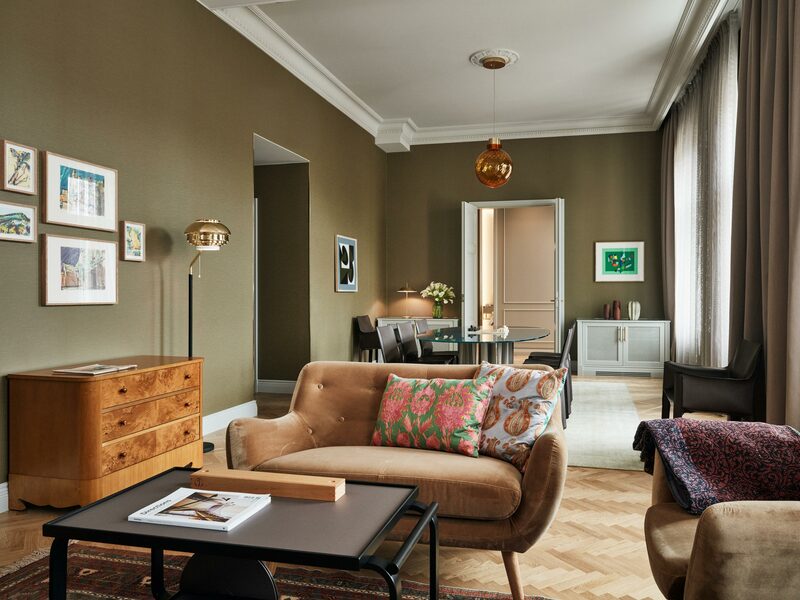 • Special power outlets (EU/UK/US) The spacious junior suite's color palette of delicate olive and brown are complemented by rich dark furnishings. Soft, hand-woven Georgian vintage carpets in unique color tones enhance the overall feeling of indulgence. The 200cm king-size DeLuxe bed within the suite represents the very best of the DUX collection. The superior look and feel of the bathroom's separate rain shower, double washbasin and bathtub is completed by Santo Tomas marble tiles from Mexico. The suite's exquisite artworks from Finnish pioneers in abstract art exemplifies the bond between Finnish nature and realism. The Hintsa Performance Experience offers a biomechanics guide for in-room exercises. 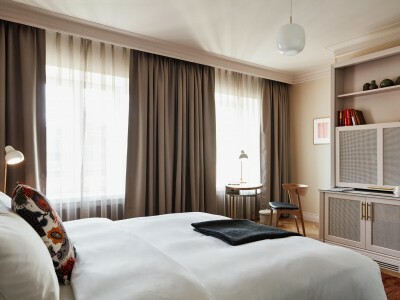 • Special power outlets (EU/UK/US) This fabulous corner suite follows a classic suite layout with a separate bedroom. The living area opens up to an impressive terrace, which blossoms with flowers in summer. Soft, hand-woven Georgian vintage carpets in unique color tones enhance the overall feeling of indulgence. The furnishings comprise of Finnish design classics from Artek along with other European manufacturers. The king-size bed within the suite represents the very best of the DUX collection. The artworks here represent classic themes from Finland's history, nature and architecture. The suite also includes a unique curated collection of literature. The Hintsa Performance Experience offers a biomechanics guide for in-room exercises. • Connects with 35sqm Serenity Studio As the historic home of the Finnish Literature Society, Hotel St. George embraces the importance of literature. With impressive artworks and a curated collection of poetry, it doubles as a sophisticated library. The suite has a separate bedroom and a living room ideal for both work and relaxation. The soft tones of the decorative details, such as the vintage carpets and furnishings, are combined with the more contemporary feel of colorful textiles and vivid prints. The rich details of internationally-renowned Finnish artist Klaus Haapaniemi's textiles tell a thousand stories. The Hintsa Performance Experience offers a biomechanics guide for in-room exercises. 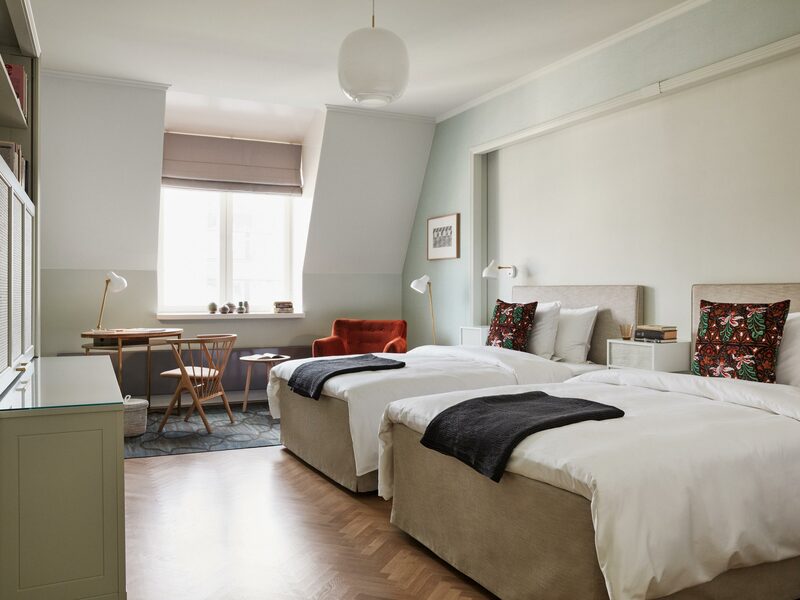 • Connects with 29sqm Atelier This awe-inspiring room with a cupola, designed by Onni Tarjanne in the late 18th century, has a rich history behind it, having hosted the functions of the Finnish Literature Society and a wealth of companies. The suite includes a large living space, a lounge underneath the cupola and a separate master bedroom. Soft, hand-woven Georgian vintage carpets in unique color tones enhance the overall feeling of indulgence. 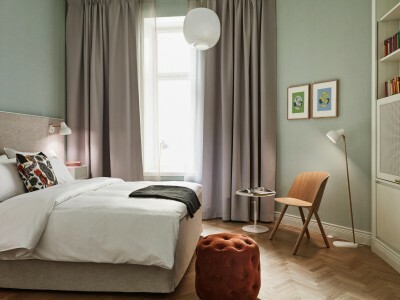 The furnishings are design classics from Scandinavian and European manufacturers. The art in the Coupole Suite is colorful, contemporary and bold, comprising lithographs from Finnish abstract art pioneers. The Hintsa Performance Experience offers a biomechanics guide for in-room exercises. 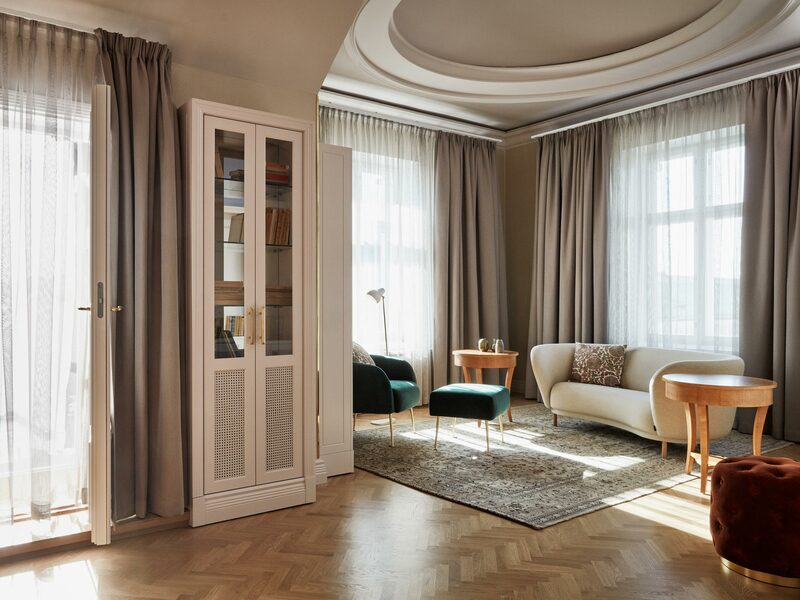 • Connects with the 47sqm Atelier The signature suite is a setting for countless stories and special unforgettable moments. This sentiment epitomises the role of Hotel St. George's spacious 3rd floor suite, which overlooks the Old Church Park. The St. George suite has a separate living room, a private master bedroom and a dining room for sharing special moments. 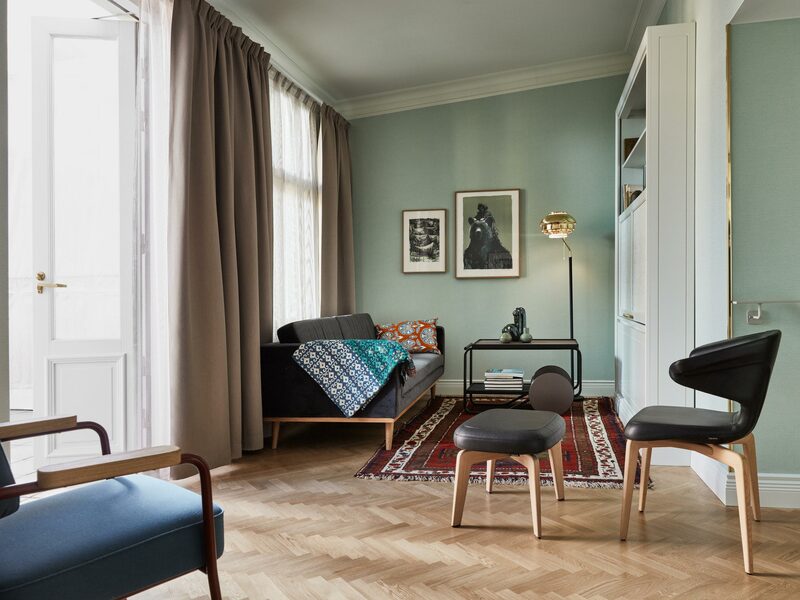 Decorative details in classic dark tones are combined with iconic modernist and contemporary furnishings with design classics like armchairs by Hjort af Örnäs that bring a touch of design history to the suite. For guests looking for ultimate intimacy, the suite has a service kitchen for private dining. The Hintsa Performance Experience offers a biomechanics guide for in-room exercises.